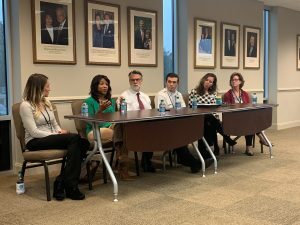 Young Philanthropists Society Host Addiction and Opoid Crisis Panel Discussion – United Way of Central Alabama, Inc. 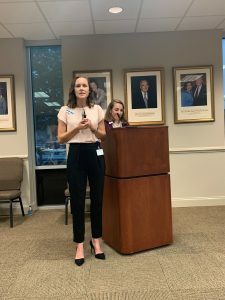 The Young Philanthropists Society of United Way of Central Alabama held a Lunch and Learn on Wednesday, November 7. The topic of the panel discussion was addiction and the opioid crisis. Panelists included Beth Bachelor, Ashley McCord, Meg McGlamery, Judge Shanta Owens, Ben Thompson, and Dr. Mark Wilson, with Leslie Plaia serving as the moderator. The luncheon started with Plaia giving background information on the topic. Opioids are drugs focused on pain relief, such as codeine, Norco, Vicodin, and Lortab. Heroin and fentanyl are two of the most popular opioids right now. It was revealed in 2016, over five million opioid prescriptions were written in the state of Alabama with 769,282 were prescribed in Jefferson County. In Walker County, an astonishing 235 opioid prescriptions were written per 100 residents. Plaia transitioned into the question and answer portion of the event. Panelists were asked what they see when it comes to addiction. Beth Bachelor, Fellowship House Executive Director, explained when people receive all the treatment they need, they seem to do well. The current issue with that is a lack of resources. Fellowship House is one of many treatment facilities who almost always have a waitlist. Lieutenant Ben Thompson, Birmingham Fire and Rescue, said fire stations in Birmingham are constantly receiving calls for both opioid overdoses and withdrawal. “When I’m at UAB and Highlands Emergency Departments, I often encounter people who simply don’t know what to do and don’t have a lot of hope. If these patients aren’t in withdrawal, there’s not much help the ER can offer them”, said Ashley McCord, Recovery Resource Center Peer Support Specialist. Leslie then asked how the opioid crisis is affecting Central Alabama. Judge Shanta Owens said, “Opioid addiction drives crime, especially property crimes. For example, many grown men come into court for things like breaking into cars and stealing CDs. With Drug Court having limited spaces, I can’t help those who don’t have drug-related charges even if what they got charged with was a result of drug use.” Dr. Mark Wilson of the Jefferson County Health Department explained as a result of the opioid crisis, there has been a vast increase of people diagnosed with Hepatitis C. Wilson told the audience how UAB Hospital received a grant to screen Birmingham residents for Hepatitis. Of those tested, 10% of Caucasian men were Hepatitis C positive. Treatment costs $70,000-$80,000, but the health department has started a Hep C Clinic where patients can receive treatment for free or reduced rates. The next question was what can we do to better help loved ones with addiction. Many panelists answers involved support. Meg McGlamery, Crisis Center Executive Director, suggested supporting someone by listening and not judging. You don’t know if you’re the only person that individual can go to. Judge Moore also shared how relapse is common for those facing addiction and those people really need others to support them if it does happen. The panel was asked what some ways to decrease the stigma of addiction are. McCord expressed how our language can really change the stigma. She said, “Instead of referring to someone struggling with addiction as an addict, junkie, or meth head, refer to them as someone going through long-term recovery.” Dr. Wilson said he hopes people start to see addiction as a disease. He said, “I hope in the future people can say I’m a person in long-term recovery just as easy as women say they are a breast cancer survivor.” Bachelor also said to decrease the stigma we need to spread the word. Beth encouraged all attendees to take out their phones and follow organizations that help with recovery efforts, such as the Recovery Resource Center and Fellowship House. The final question Plaia asked was how United Way of Central Alabama is helping with the opioid crisis. Bachelor explained how helping people recover from opioid addiction is not a one agency issue. 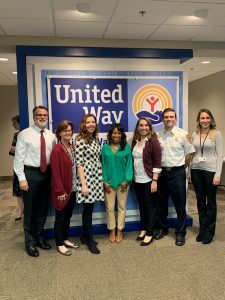 Many agencies work together, and United Way makes it easier to do so. For example, someone addicted to opioids may call the Crisis Center for help to overcome addiction. The Crisis Center can then get them connected with Fellowship House to receive in-patient treatment, but if there isn’t a bed open for a few days at Fellowship House, they can then get connected with Salvation Army for a place to stay until they can enter treatment. McGlamery said United Way of Central Alabama offers fantastic support and is doing phenomenal work throughout Birmingham. She explained how the support received by her agency makes her believe in United Way and continue to be a leadership giver each year. If you or someone you know is currently struggling with addiction, contact the Recovery Resource Center at 205-458-3377. The Recovery Resource Center, a program of the Crisis Center, is a collaborative initiative dedicated to simplifying the substance abuse treatment process. The Crisis Center’s Crisis Line is also open 24 hours a day 365 days a year. A telephone counselor can be reached at 205-323-7777. Young Philanthropists Society is currently accepting new members. As a member of this organization, you will have the opportunity to learn more about community needs and the work being done through lunchtime tours of partner agencies and chances to hear from experts in the field. YPS members also get the chance to take part in hands-on volunteer projects throughout the year, and invitations to network with like-minded peers, as well as corporate and community leaders. For more information, contact Elizabeth Ragland at eragland@uwca.org or Joanne Patterson at jpatterson@uwca.org.